‘The Gasbags of Jupiter’ sounds for all the world like the title of an early 1930s novel that would have run in a venue like Science Wonder Stories. In fact, as Larry Klaes tells us below, the idea grew out of Carl Sagan’s speculations about free-floating life-forms that might populate the atmospheres of gas giant planets like Jupiter. Cornell physicist Edwin Salpeter had much to do with the evolution of that concept, helping Sagan produce a paper that was a classic of informed imagination (and one that led to numerous science fiction treatments as the idea gained currency). Larry’s celebration of Salpeter’s life gives a nod to that paper but also notes his deep involvement in the study of the most distant celestial objects. On March 14, the Department of Astronomy at Cornell University will commemorate the life of one of their most prestigious faculty members: Edwin E. Salpeter, the James Gilbert White Distinguished Professor of Physical Sciences Emeritus. Salpeter died of leukemia last November 26 at his home in Ithaca, just before his 84th birthday. The biographies on Salpeter, who came to Cornell in 1948, primarily mention his work in the astrophysics of distant cosmic objects. As just one example, Salpeter was among the first scientists to come up with the current explanation for the enormous energies from quasars, which is short for QUAsi-StellAr Radio sources. The cores of these very distant galaxies contain supermassive black holes which collect vast amounts of debris that are pulled into fast-spinning accretion disks around these gravitational wells. So much debris falls onto these black holes that it is often ejected back into deep space in relatively tight beams known as relativistic jets, which shoot out across intergalactic space for many thousands of light years. Quasars are some of the most luminous objects in the Universe and thanks to Salpeter’s work on understanding their nature, astronomers have a much better idea how these distant bodies are such powerhouses. 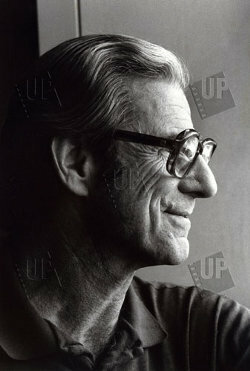 Image: The physicist Edwin Salpeter, photographed in 1978. Credit: Cornell University. But perhaps the most recognized work of Salpeter is, ironically, one that many probably do not know he was involved with, or that his collaborator was one of the most recognized names and faces in science: The late Cornell astronomer Carl Sagan, who died in December of 1996 from myelodysplasia, a rare form of leukemia. Among Sagan’s many and varied interests, perhaps his favorite was extraterrestrial life. Sagan was one of the pioneers who brought about the acceptance by the mainstream science community of the possibility that beings of all kinds existed beyond our planet Earth. He would often speculate on alien life on worlds and in realms few had considered at the time. One of Sagan’s truly revolutionary ideas about aliens was the concept of creatures that dwelled not on or in the surface of some Earthlike planet but spent their entire lives floating in the atmosphere of giant gaseous worlds such as Jupiter, which could hold over one thousand Earths. Unlike the inner terrestrial worlds such as Venus and Mars, Jupiter and its fellow giants are made up primarily of atmospheric gases, though the incredible pressures in these worlds’ lower layers of air turns the hydrogen in them into a metal. Sagan thought that since the upper atmosphere of Jupiter was relatively friendlier by comparison and contained many complex organic molecules, they may have had time in the five billion years since the formation of the Solar System to turn out some type of life, an aerial form of creature that never touched or knew a planetary surface. To determine just how scientifically plausible such aliens might be, Sagan asked his colleague Salpeter to help him produce a paper on the subject which was titled “Particles, Environments, and Possible Ecologies in the Jovian Atmosphere.” The paper first appeared in the prestigious The Astrophysical Journal Supplement Series in late 1975. Sagan and Salpeter envisioned three main types of Jovian creatures. There were sinkers, small organisms which were constantly falling towards the deadly deep, dense, and hot layers of the planet but always managed to survive long enough to produce offspring that would stay up in the more habitable air layers to repeat their cycle of life. The other aerial residents of Jupiter were known as floaters, which Sagan would later describe as being “kilometers across, enormously larger than the greatest whale that ever was, beings the size of cities.” Floaters were seen as drifting across the vast alien sky in great herds, looking like a collection of immense balloons, which in essence there were, using the lighter elements of Jupiter’s atmosphere to stay aloft. Image: Salpeter and Sagan’s Jovian aerialists, as imagined by the artist Adolf Schaller. The paper also noted that the two Voyager space probes scheduled to make flybys of Jupiter in 1979 had cameras powerful enough to just resolve the floaters if such beings existed at that world and were high up enough to be spotted. Whether the images of Jupiter’s swirling, colorful face that were later returned by the twin robot explorers were ever scrutinized for any floaters remains unknown. Landmark as this paper was, it was the appearance by the Jovian aerial beings in Sagan’s equally landmark television series Cosmos that brought this concept to the general public. In the second episode of the thirteen-part PBS series first shown in 1980, the Jovians were briefly introduced in a magnificent painting made by artist Adolf Schaller. Sagan also mentioned his colleague by name as the person who helped to bring these strange beings to life in both the episode and in the companion book to the series. The Cornell scientist noted that even if sinkers, floaters, and hunters did not actually live on Jupiter, they might still dwell on some other worlds in the Milky Way galaxy. More information on the Cornell commemoration of Edwin E. Salpeter, which takes place on March 14 at Barnes Hall, can be found here. The classic Salpeter and Sagan paper is “Particles, Environments and Possible Ecologies in the Jovian Atmosphere,” Astrophysical Journal Supplement Series, vol. 32, Dec. 1976, pp. 737-755 (available online). 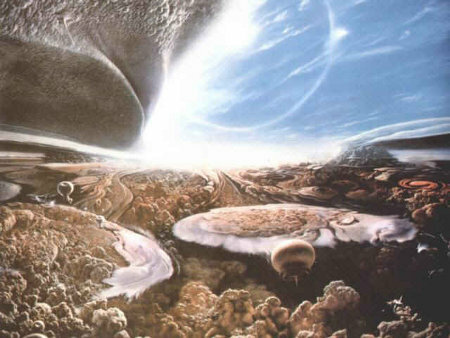 The possibility of floaters and hunters as envisioned in the above artist rendering is so cool it is just plain freaky. Yet, such life forms may be a possibility within the Jovian atmosphere. If such life forms can arise in Jupiter with a finite probability, then in an infinite universe, with an infinite number of Gas Giant Planets in orbit about 5 AU to 15 AU from a parent star wherein the star is a G-2 or sun class star, such floaters and hunters should have evolved on an infinite number of planets. By the way, the depictions are beautiful and show how pure art work can augment and popularize astronomy. I would be good to find intelligent life of this kind. They could sell us all of the Earth-like worlds that they have found and we can sell them all of the gas-giants that we find. Someone negotiates the sale of Jupiter to some gas bags in return for an asteroid belt in another system near the end of “Schismatrix”. Maybe some of the gas giants found in the water zones of their stars might be better bets than Jupiter itself. A Neptune-type planet (which would be more enriched in metals than a Jupiter-type one) located in the habitable zone could offer interesting possibilities, and the gravity on such a planet would be relatively Earthlike. The outer planet of the HD 69830 system might fit the bill. Even our own Neptune gets pretty warm as you travel downwards – perhaps it’s wet enough for something to evolve? Energy sources would be a major issue so a planet closer to the Sun may be a better locale for an aerial biosphere. Iain Banks paints a fantastic picture of gas giant lifeforms in “the algebraist” suggesting that those life forms are actually the most common in the universe but that they never took hold in our system because the gas giants here are “deserts”. I’ve also enjoyed reading about Banks’ ‘dirigible behemothaurs’ in Look to Windward. Fascinating writer. Banks’ is also fond of the comical depiction of ETIs. His description of “The Affront” – from a Neptune type planet – is quite reminiscent of old “Benny Hill” sketches, which is a bit odd for a bunch of floating jelly-fish like aliens. David Brin also has gas giant aliens, called Zhang as a generic term, in his “Uplift War” continuation novels. They live in an uneasy relationship with oxygen breathers due to their mutual incomprehension, though they can co-operate. It would certainly help explain the Fermi Paradox if most ETIs lived on gas giants. The issue with lifeforms on Jupiter-type planets is the severity of turbulence, particularly in the vertical direction. If lifeforms would be rapidly transported between extremes of pressure and temperature, things are rather less promising than if there are more stable regions. As for science fictional depictions, why hasn’t Wheelers by Ian Stewart and Jack Cohen been mentioned yet? I have Wheelers but I’ve never read it. Something annoyed me about their writing when I started so I never finished. Worth persevering do you think? Well Wheelers is pretty much a fictional elaboration of Evolving the Alien, it has interesting ideas but I wouldn’t say it’s great. Same goes for the sequel. were also aerial creatures but he focused on the aquatic ones. AM: You say that Jupiter may be the most likely place to find extraterrestrial life, since the planet has organics, water and energy. Yet Jupiter is rarely seen as a likely place for life by most astrobiologists. Do you have any thoughts about what sort of creatures could exist there? BB: Most scientists ignore Jupiter because of the enormous difficulties of exploring the planet. However, in my novel “Jupiter” I postulated a biosphere that included airborne species below the Jovian cloud deck, and gigantic aquatic species in the planet-wide ocean that girdles Jupiter. up Jupiter and bye bye floaters. I’m not entirely convinced by Bova’s model of the interior structure of Jupiter. Any “ocean” would probably be hydrogen not water… maybe on Neptune it’d be more watery. Indian scientists flying a giant balloon experiment have announced the discovery of three new species of bacteria from the stratosphere. In all, 12 bacterial and six fungal colonies were detected, nine of which, based on gene sequencing, showed greater than 98 percent similarity with reported known species on earth. Three bacterial colonies, however, represented totally new species. All three boast significantly higher UV resistance compared to their nearest phylogenetic neighbors on Earth. The experiment was conducted using a balloon that measures 26.7 million cubic feet (756,059 cubic meters) carrying 1,000 pounds (459 kg) of scientific payload soaked in liquid Neon. It was flown from the National Balloon Facility in Hyderabad, operated by the Tata Institute of Fundamental Research (TIFR). An onboard cryosampler contained sixteen evacuated and sterilized stainless steel probes. Throughout the flight, the probes remained immersed in liquid Neon to create a cryopump effect. The cylinders, after collecting air samples from different heights ranging from 20 km to 41 km (12 to 25 miles) above the Earth’s surface, were parachuted down and retrieved. The samples were analyzed by scientists at the Center for Cellular and Molecular Biology in Hyderabad as well as the National Center for Cell Science in Pune for independent confirmation. One of the new species has been named as Janibacter hoylei, after the astrophysicist Fred Hoyle, the second as Bacillus isronensis recognizing the contribution of ISRO in the balloon experiments which led to its discovery, and the third as Bacillus aryabhata after India’s celebrated ancient astronomer Aryabhata (also the name of ISRO’s first satellite). The researchers have pointed out in a press release that precautionary measures and controls operating in the experiment inspire confidence that the new species were picked up in the stratosphere. “While the present study does not conclusively establish the extra-terrestrial origin of microorganisms, it does provide positive encouragement to continue the work in our quest to explore the origin of life,” they added. This was the second such experiment conducted by ISRO, with the first one in 2001. Even though the first experiment had yielded positive results, the researchers decided to repeat the experiment while exercising extra care to ensure that it was totally free from any terrestrial contamination. Physicist Freeman Dyson remembers friend and colleague Ed Salpeter. One of his first memories of Ed Salpeter, said physics department chair Saul Teukolsky, stems from one of Teukolsky’s first visits to Cornell in the 1970s. No mention of his work with Carl Sagan on the gasbags of Jupiter. 35 years ago this week Jupiter’s thirteenth satellite (in order of discovery), Leda, was discovered by Charles T. Kowal. Even though most of us have been suffering from poor seeing conditions due to both hemisphere’s seasonal climate changes, the changes we’re experiencing look like nothing compared to what’s happening on Jupiter. If you think we’ve got turbulent atmosphere and more than our fair share of clouds – then check out what John Chumack’s been watching! From little green men to the crustacean-like ‘prawns’ of ‘District 9’ and H.R.Giger’s nightmarish creation in the ‘Alien’ films – our appetite for imagining how visitors from another planet might look shows no sign of diminishing. According to a British satellite expert and government adviser, however, the outlandish imaginings of Hollywood may not be quite alien enough. Dr Maggie Aderin-Pocock – a leading scientist at European space company Astrium – has suggested that, far from being little green men, aliens could actually look like giant jellyfish. No doubt an inspired relative of the Jovian gasbags Sagan and Salpeter envisioned back in 1976. “Within the thick clouds of the planet Polyphemus; an elusive colossus exists. It is rare to witness the Polyphemus Gas Giant, but it is a site to behold when one is seen in the open. It emits gases from its porous epidermis as a natural camouflage, a literal smokescreen to blend into its habitat. It is a mystery to how large these graceful creatures are. Eyewitnesses have accounted seeing their tails extending kilometers without being able to see the end. It is still unsure to whether these conjectures are true or not.